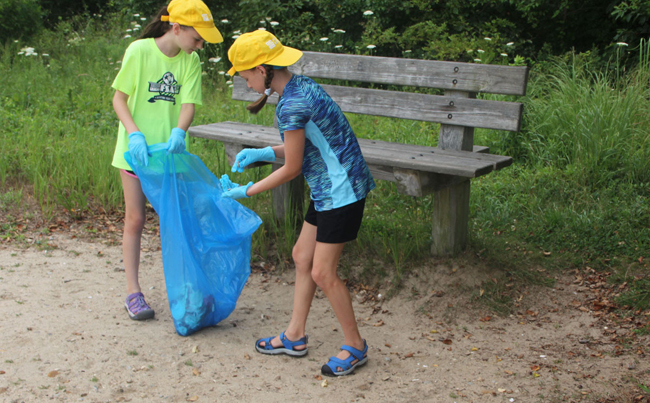 Maya Fisher and Charlotte Preuss collected numerous cigarette butts around a bench at Bluff Point State Park during the cleanup. Credit: Judy Benson / Connecticut Sea Grant. Stony Brook, NY, September 9, 2018 - In summer 2017, Long Island Sound Study’s social media campaign informed residents of global crisis of plastics in the ocean and and how it affects our own wildlife in the Sound. This past summer the campaign continued with a request to ask residents to break the plastic habit by bringing a reusable bottle or bag to the beach or shoreline park, and make sure waste is properly disposed of or carried out. Credits: Long Island Sound Stucy; CT Sea Grant; Lucy Reading-Ikkanda. Long Island Sound Study and its partners educated thousands of social media users in the summer of 2017, about the problem of marine debris in Long Island Sound. The #DontTrashLISound campaign posts and tweets were seen more than 80,000 times on Facebook and Twitter from mid-July to International Coastal Cleanup Day on Sept. 16. The posts included a graphic on the top 10 types of litter found in the Sound, the harm abandoned gear is having on fish and other marine life, and the threat of microplastics to water quality. There were also posts on what people are doing about the problem, including a local prevention program to reduce litter in restaurants, removing “ghost gear” such as abandoned lobster traps and fish lines that can entangle marine organisms, and beach cleanups. At its quarterly meeting in September 2017, the Long Island Sound Study Public Involvement and Education work group, which consists of members of citizen groups and resource managers working through the Long Island Sound Study, agreed to continue the campaign. The campaign’s social media posts in summer 2018, which run through September 14th, have been viewed more than 50,000 times from July 31 to August 15 on Facebook, Twitter, and Instagram. The marine debris campaign, LISS’s second, is focusing this year on encouraging Long Island Sound residents to “Break the Single-Use Plastic Habit” by bringing their reusable bags and bottles to the beach this summer. Besides the social media posts, LISS’s partners have held a beach cleanup and press event at Bluff State Point Park in Groton, CT, will be holding a beach cleanup at Sunken Meadow State Park at Kings Park, Long Island, and published an op-ed column on the problem of plastic trash in the Sound and in the oceans. Learn more about the campaign at www.DontTrashLISound.net. Also, you can see what's trending with #DontTrashLISound via LISS's Media Center and follow the hashtags #DontTrashLISound (Facebook) or #LISound (Twitter). There are many organizations in New York and Connecticut that need your help restoring and protecting Long Island Sound. For more information on how to get involved, please check out related LISS's Web resources. If you would like to be added to the mailing list, or your organization would like its volunteer event advertised please contact New York Sea Grant's Long Island Sound Study Outreach Coordinator Anna Weshner-Dunning at amw392@cornell.edu or 631-632-8730. 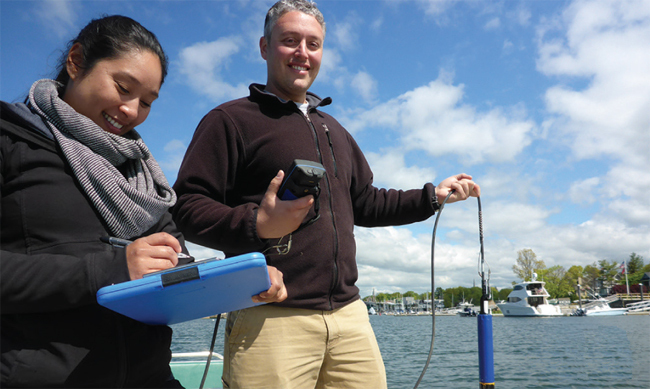 Connecticut Fund for the Environment monitors the Sound as part of the Long Island Sound Futures Fund Grant Program. See www.longislandsoundstudy.net/grants for descriptions of all projects. Credit: LISS. Also this year, the Long Island Sound Study's newsletter Sound Update offered a 2017 snapshot of the national estuary it serves. Released this past Spring, the issue's pages highlight various clean water, habitat restoration, education, and science projects from Connecticut and New York. The 2017 Year-in-Review places a spotlight on the Long Island Sound activities accomplished in 2017 to fulfill the goals of the Long Island Sound Comprehensive Conservation and Management Plan, and the 2018 Long Island Sound Study National Estuary Program work plan, which details the projects being funded through the Long Island Sound Study in the federal fiscal year beginning Oct. 1, 2018. Included are maps detailing the Long Island Sound Future Fund, a program that has provided $2.04 million in grants to groups that matched those funds with an additional $3.3 million to conduct 30 stewardship, restoration, watershed management and education projects. Another map pinpoints coastal lands protected as well as where habitat restoration projects took place last year. There's even a related interactive map on LISS's Web site featuring the 33 locations along the coast of the Long Island Sound that provide exceptional ecological and recreational value, see LISS's "Stewardship Area Atlas." Also for visitors: an archive of "stewardship success stories and videos" to peruse. For more details on these and other achivements, check out LISS's Spring 2018 issue of Sound Update (pdf). Additional program updates can be found in the Summer e-newsletter Sound Bytes, including details on a new "Discover Long Island Sound Exhibit" now at the Mystic Aquarium. There's also an archive of LISS's newsletters. For daily updates and tips on how you can help protect and restore Long Island Sound, please join LISS on Facebook, Twitter or, sign up for their RSS feeds.